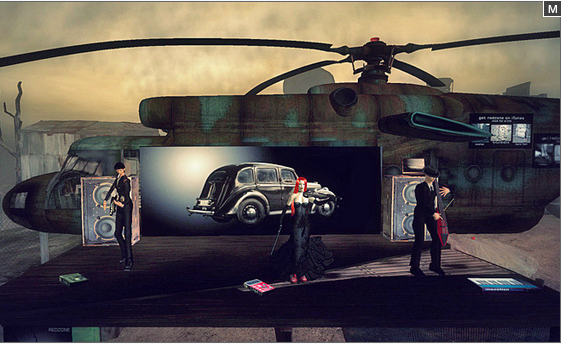 Concerts in Second Life generally aim to reproduce the conditions of live music in real-world venues. The music itself, however, is made in the real word and streamed into Second Life, which problematises the idea of ‘live’ music. Rather than seeing it as irrelevant, Second Life residents have developed their own understanding of what liveness means, and the extensive debates through which this understanding has emerged illustrate the social construction of liveness in action. At the same time, technological limitations of the Second Life platform undermine the whole approach of reproducing real world concerts: the variable lag that is a permanent feature of Second Life means that accurate and predictable synchronisation of images, gestures, chat, and streamed sound is impossible. Co-authored by a musicologist and by the co-founder of the virtual band Redzone, and using one of Redzone’s performances as a case study, this paper argues that the most effective way to create liveness in Second Life is not to reproduce the conditions of real world performance, but rather to reconstruct liveness based on the technological affordances of virtual reality. Nicholas opens with a discussion of ‘whatever happened to Second Life’? The answer, he says, is that while the initial hype has died down the platform continued, and there are still many tens of thousands of users. We listen to Russell Eponym, a real-life singer-songwriter who is one of the biggest SL artists. There is a cross-flow of publicity between the RL (real life) and SL (Second Life) versions of these artists – their careers span the real and virtual worlds. We see some SL music shops where instruments and microphones can be bought. Nicholas briefly describes the mechanics and challenges of SL technology, particularly the delay (known as ‘lag’) between action and perception – SL is not a truly real time activity, and the experience is not always predictable. Bandwidth differences mean that different participants have different experiences. SL communities talk about lag the way people in RL talk about the weather. But this does not diminish the interactiveness of the experience. Citation: Coming of Age In Second Life. 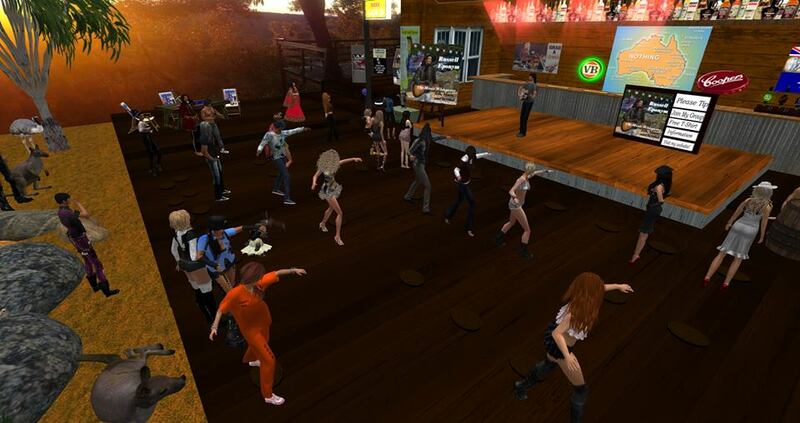 If it is hard to tell the difference between live and recorded music in RL concerts, it is even more difficult in SL, because recorded music can be streamed into the SL environment. SL etiquette does not consider streaming previously recorded music to be a truly live performance. Blog entry: Attention Virtual Musicians! Is it Live or is it Memorex? If [you’re] a musician in Secondlife or any other virtual setting were we cant see your real face.. Please please please.. If your going to say your live, be live. Or just tell everyone your going to play a recording. Its all good. There is no need to try and fool anyone. The word ‘live’ in this context is noy used to define intrinsic, ontological properties of a performance,… but rather is a historically contingent term. The sense of community arises from being part of the audience. One solution to these lag problems is to design music with SL in mind. We now hand over to Justin, who discusses his virtual performances, showing us a picture of the derelict RI-6 helicopter that his band RedZone use as a performance venue, situated in the ‘Wastelands’ of SL. The avatars perform ‘AV gestures’ – moving in and out of the screen at particular sonic points in the performance. The idea is that the band works by ‘filling an AV hole’ rather than dealing with fine motion and detail of the RL performances. Nicholas now returns, noting that just because the SL performance does not literally replicate the performers’ literal movements, but they are signifiers and representations of RL performances. The most effective approach to creating liveness in VR is to reconfigure a notion of liveness within the context and constraints of the medium. He argues that this is exactly what happened in the history of sound recording. An audio artefact was originally intended to be a literal reproduction of a live performance, but very quickly adapted to its own musical medium, culminating in an experience that could be described as ‘hyper-realism’ – more real than the real thing. Virtual technologies (including sound recording) are often, in their early days, misinterpreted as an inferior manifestation of reality, whereas in fact literal replication is not their goal. Virtual performance can be considered a creative practice in its own right. [JB comment] I suggest that SL music is like all artistic media, in that its constraints define its content, and therefore the creativity that exists within the medium. The quest for literal replication is moulded through constraints into a new art form.